The UEJ (Union des Éditeurs de Jeux de société) is proud to announce the establishment of an official framework for certification of boardgames. 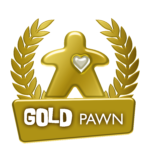 The Gold Pawn© is a certification awarded to a boardgame based on the number of copies sold worldwide. It is an international award, with objective and impartial criteria in the style of Gold Records© in the music industry. raise awareness for the boardgame industry, its commercial and popular impacts, as well as its best-sellers. give an official and certified framework to these awards which can become a strong point of reference for the public and the press. 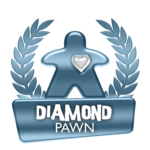 offer coverage to popular games.